People who are in abusive relationships or are being harmed by someone in their lives were encouraged to reach out for help during a ceremony held on Friday, Oct. 7 that also remembered Burlington County residents who lost their lives to domestic violence. 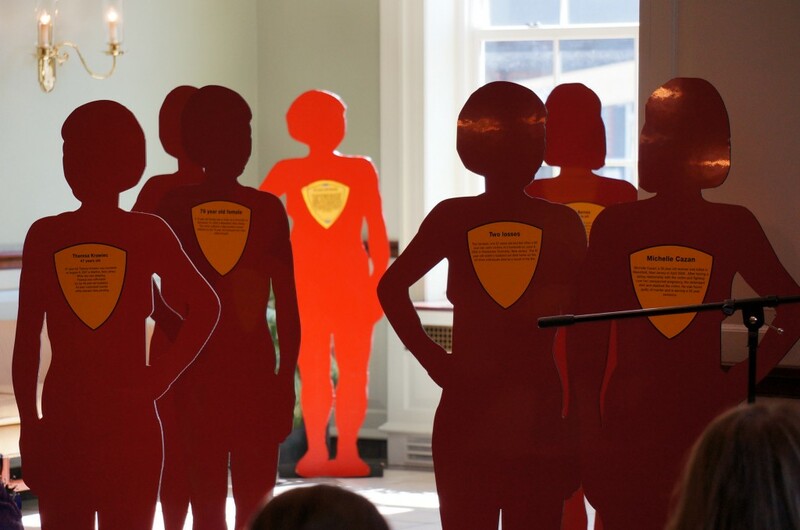 The ceremony, known as The Silent Witness Project, featured several life-sized silhouettes that represent citizens of Burlington County who were killed by domestic violence. The event is held in October as part of National Domestic Violence Awareness Month. Providence House, which provides comprehensive services for victims of domestic abuse and their children free of charge, was joined in sponsoring the event by the Burlington County Prosecutor’s Office, the Burlington County Sheriff’s Office, Rowan College at Burlington County, Soroptimist of Burlington County and Servicios Latinos de Burlington County. “While we mourn and hold in our hearts those who lost their lives to violence this year, the Silent Witness observance also recommits us to working to prevent such tragedies from occurring in the future,” said Mary Pettrow, Associate Director, Providence House Domestic Violence Services. The event was held at Rowan College at Burlington County’s Mount Holly Center. RCBC officials felt honored to host the event again this year, said RCBC President Paul Drayton. The purpose of the ceremony is not only to remember victims of domestic violence, but also to raise public awareness about the problem and stress that assistance is available to those in abusive relationships or situations. The Silent Witness Project traces its origin to Minnesota in 1990 when a group of artists created an exhibit of life-sized silhouettes, each representing a murdered victim of domestic violence in their state. It has since become a collaborative effort to honor victims lost due to acts of domestic violence in communities throughout the nation. There were 62,055 domestic violence offenses reported in New Jersey in 2014, which is the most recent year for which statistics are available. That number represents a 4 percent decrease from 2013. Of those who were abused in New Jersey in 2014, 42 were killed, compared with 44 the previous year. In Burlington County there were 3,450 domestic violence offenses reported during 2014, a decrease of 161 from 2013. As the keynote speaker at today’s event, Burlington County Prosecutor Robert D. Bernardi urged people in abusive situations to take advantage of available resources. “I want to emphasize that there are programs in place to protect you and your family members,” Prosecutor Bernardi said. “Let me say that again — there are programs in place to protect you and your family members, but only if you come forward and let us help you. If you or someone you know is being abused, call the Providence House domestic violence hotline at 1–877–871–7551.